Did you know that having a support account has many more features than just creating another username and password to remember? Check out all the benefits below. Note: Click on the Blue Text to jump to more information and examples for each feature. Ticket History - You can look-up every ticket that you have ever created and read all the comments that were posted. We do not delete anything. You will never have to say "I can't remember what I did" ever again. Ticket Search - Not only do we have ticket histories on file, you can also search for key words and titles to find the information you need. Ticket Information - Do you wish that you could see the agent that is assigned your ticket? Do you wish that you could see the last time a ticket was updated? Do you wish that you could see where your ticket is stationed? Or maybe you want to know if the support team is waiting on you to respond? All of this information can be found in your account. Easy Ticket Reading - Have you ever been confused by an email response that appears to just have a lot of code in it? Well reading a ticket from your account formats all that code into an easy to read layout. (Be sure to view the images under this section). Tracking Phone Calls - Did you know that AmeriCommerce online stores takes every phone call and creates a ticket? Normally we ask you for an email and a website when you call. But with an account, you can set your phone number. This way when you call, we know exactly who you are and can immediately begin assisting you. This also means you can search your account for old phone calls as well as tickets! Ticket Creation Assistance - Creating a ticket from email can be faster, but what if you forget your website? We have to ask and there is a small delay in assisting you. If you create a ticket from your account, we require all information necessary to start assisting you from the beginning. This results faster service. Also, when you enter the Subject for the ticket, we automatically suggest knowledgebase articles that could resolve your issue! Follow Knowledgebase Articles - Do you have some knowledgebase articles that you refer to regularly but hate searching for them every single time? With an account you can follow as many articles as you like and then view them from your account! On top of seeing the articles that you care about, you can also get email notifications when those articles get updates. Community Access - Join the community. Start posting some questions in a public thread and see if other store owners can share their knowledge. Answer other users questions. Together who knows what you all can accomplish. Signing up for an Americommerce support account is as simple as 1, 2, 3! Enter your full name and email address in the following pop up, confirm you are not a bot, and click Sign Up. This is as awesome as it sounds. You can see every ticket that you have ever submitted and you can see the status of it in just one glance. As if seeing all your requests was not enough you can look up all the tickets that you are CC'd on. That means if your coworker submitted a ticket and CC'd you on it you can see it as well. Now you know that you can see all the tickets you have submitted, but that is a lot of information to look through. Use the search feature to narrow down the listings by searching for a ticket number, title, agent or just a keyword! With all those options available finding the ticket you need will be a breeze. Each ticket that you have has a lot of behind the scenes information handled by the Support Team at AmeriCommerce online stores. You can find some of that information when viewing a ticket from your support account. You can see the agent you are working with. Or maybe you would like to see if the ticket is waiting on you to respond. Or you may want to know if development is reviewing the ticket. 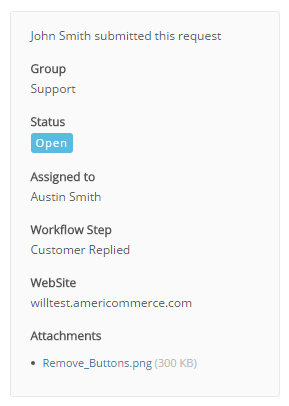 Using the Group, Status and Workflow Step can provide a lot of good information that you didn't have access to before. 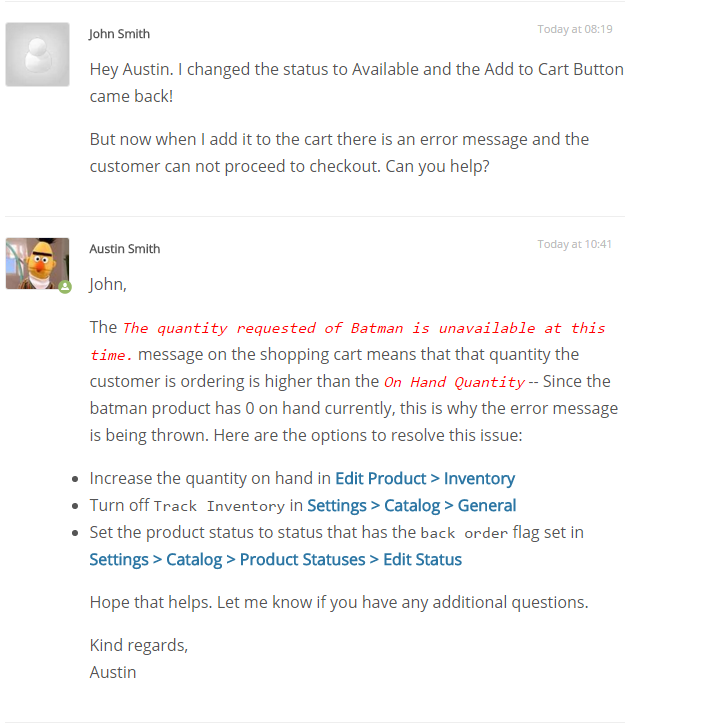 Sometimes the Support Team will add markup into a ticket to make it easier to read. 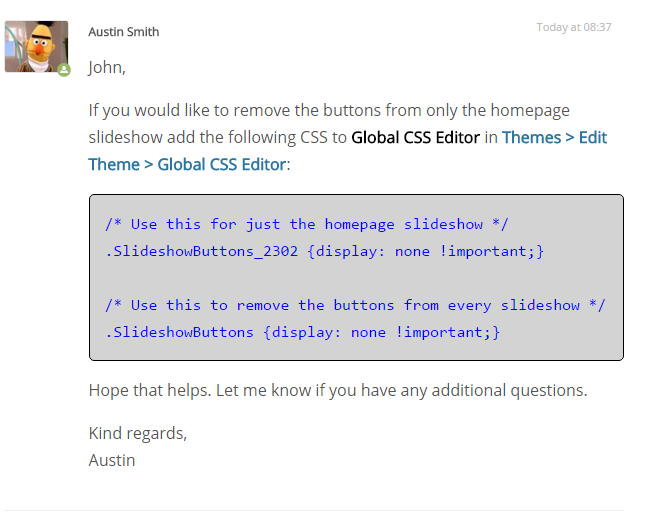 Most email providers support markup now so you can read the messages with relative ease. However, we designed the ticket formatting to resemble what the support agent sees when working your ticket. Using a support account gives you a consistent look and feel on every ticket you submit. The AmeriCommerce online store Support Team creates a ticket on every phone call that you make. If you have an account, the tickets will associate to that account and you can see all your Phone Calls in your Ticket History as well. This will allow you to see all your interaction with the Support Team regardless of whether it was a call or a ticket. Making a ticket from the Support Portal can be very rewarding. When you submit a ticket, all the required information that a support agent needs is required to make sure it is entered before submission. 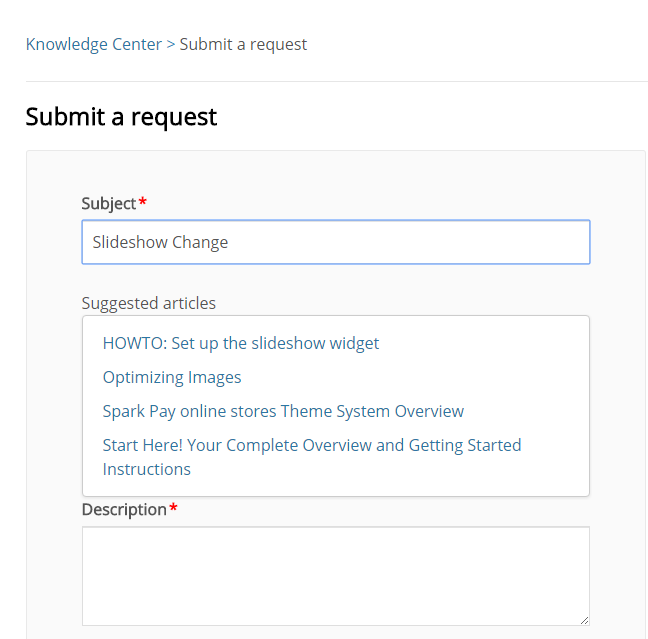 You can also see suggested Knowledgebase Articles from the Subject that you enter. This means you may be able to solve your problem without ever even having to submit it! Having a support account gives you the ability to follow knowledgebase articles. This has 2 different advantages. First, you can mark all the knowledgebase articles that you find most helpful and view them from your activities. This keeps all the knowledgebase articles that you care about in one location that is easy to access. Second, you can receive email updates when someone posts a comment in an article or it gets updated. This is where you can talk to your peers. Store owners can unite and collaborate to enhance their customers experience. You can provide each other with ideas, answers to questions and solutions to problems. The community is only as interactive as you are. The more you post and interact, the larger the community will grow. You can still be sure that Support Team members will be jumping in to the community to assist where we can as well.